Many of Night Shade’s paperbacks show up at various Barnes & Noble bookstores so hopefully this one will also. If you can’t find it there, order it from Amazon via this link. It is my hope that this book will sell well and lead to further collections available on bookstore shelves! 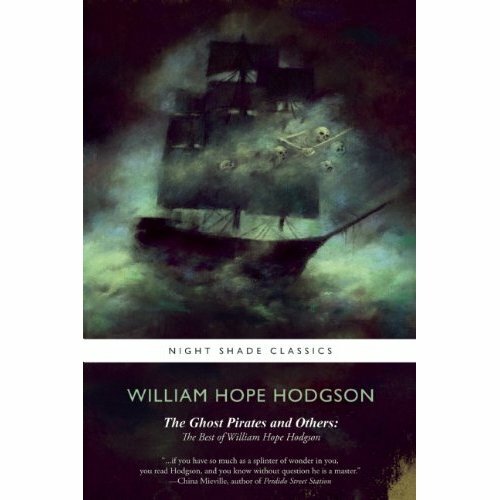 I wonder how much overlap there is between this and a collection I have: Adrift on the Haunted Seas: The Best Short Stories of William Hope Hodgson. It doesn’t have “The Ghost Pirates,” but it does have one Carnacki story. It also has several of his poems. The Hodgson collection from Night Shade Books, all five volumes, are still available as ebooks. If you go to Baen ebooks you can get the entire bundle for around $30. I know that the Night Shade Books (and several other Hodgson volumes) are available as ebooks and I thank everyone for mentioning that. I suppose I have my old prejudice against such things as I am an old fart bibliophile and prefer solid books over ebooks. Still, I need to remember that not everyone feels the same as I do! And, after all, anything that brings more readers to Hodgson is to be applauded. The Hodgson collection, all five volumes, are still available as ebooks from Night Shade Books.